Some of you might have picked up on the fact that I’ve been cultivating a practice in meditation and mindfulness this past year. This practice has remained important to me because of the role I’ve found it play in helping me to find clarity within my own heart, and a subsequent ability to express greater kindness and compassion in the world. In encountering this phrase, I was captivated. Not only did it capture my own journey, but it succinctly articulated the change I feel is needed in our interpersonal relationships, communities, nation and world. Hooked, I went to the source of this phrase, Pope Francis, and dug into the context and intention in which he articulated this idea. I was lead down an educational, albeit deep hole of Catholic theology and history. Take a deep breath, – it’s not my intention to take you there with me today. But I will provide you with some context, before highlighting core components of this revolution, and my take on what participating in said revolution asks of us. Pope Francis first used the phrase “the revolution of tenderness” in 2013 when he delivered the “The Joy of the Gospel,” his proclamation of the mission and tenants of the Catholic Church. Our opening reading contains the first time the phrase was uttered. “The Son of God, by becoming flesh, summed us to the revolution of tenderness.” As a diverse group with different theological and emotional histories in regards to our understanding and relationship with Christ, I recognize that the phrase “the son of God, by becoming flesh,” might not be the most approachable. Just hang with me for a minute. That is a profound call. Having a sense of many of the hearts that are here today, regardless of the spiritual traditions or values that guide us, I don’t think it’s much of a leap for us to get behind tenderness. To act with a gentleness or kindness, with a sensitivity to pain embodies the first and second principles of Unitarian Universalism; the inherent worth and dignity of every person and justice, equity and compassion in human relationships. Yet when I look honestly at my own life, I find daily moments where my reactions or responses are subtly and sometimes overtly callous or unkind. There are seemingly trivial and common blemishes in tenderness; the grumblings that sneak out under my breath at inattentive drivers, internal complaints about a colleague not putting supplies away after an event, the annoyance with loud neighbors. And I know of some more significant hardnesses of my heart; at times, I still find myself defensive when I talk with my mom – I’m quite attached to the story that she doesn’t really understand what I’m saying to her. The great irony exists in me that I’m most intolerant of people who are intolerant, and more recently I’ve noted a quiet, yet seething frustration at the rhetoric and response to the present political climate. I’m sure that I’m not the only one with shortcomings like these. The presence of these flaws alludes to a disconnect between maintaining a value of tenderness and the act of tenderness. For me, the revolution that Pope Francis called for lies in the movement from the held value of tenderness to the lived experience of it. It’s all very nice and neat on paper, but the question remains, what supports this revolution? In reading all of “The Joy of the Gospel,” as well as a literary analysis of the work by Walker Kasper’s I found five notable components of the revolution of tenderness that I’d like to explore together now. At its foundation, the revolution of tenderness calls for a re-orientation of thought and deed. One of the more challenging relational experiences I’ve had over the last few years was with my best friend from college, Lara. Lara is the gentlest spirit I’ve ever met and for years now, she has been my anchor. She’s amazingly steady and supportive, with a saint-like ability to offer care. These are some of her most beautiful qualities, but I’ve always worried how all this steadiness for others might be keeping her from prioritizing and knowing her own dreams, for showing up for herself. When Lara graduated from McPherson, our alma matter, I really wanted her to move out to Logan. Unsure about how Lara would fit into my life and community here and admittedly a little closed to letting go of my autonomy, I never told Lara how much it’d mean to me to have her move out here. All of this non-commitment left Lara feeling unwanted. She ended up moving out to Massachusetts to live with another alum of our college, Melisa. An important detail of this story is that Mel, was the first person that I ever deeply loved, my first experience of heartache. At the time of Lara’s decision, I felt angry, hurt and betrayed. At the center of my own movie, all I could focus on was the separation between Lara and I, my old heartache, a lack of control, and profound vulnerability. It was only after a process of re-orientation, that I was able to hear how strongly Lara’s fear and uncertainty about her future, her need for community and support as she figured out her place, and her own hurt at not feeling welcome in Logan contributed to her decision. I was so focused on self, that I couldn’t see all the other plot lines around me. Only when we can re-orient, can we act from a holistic and empathetic perspective that is at the core of tenderness. The second foundation of the revolution of tenderness is inclusion. For me, our traditional understanding of the word is only the first step towards tenderness. As a congregation committed to social justice, most of us are patterned to reach out to the marginalized, afflicted, and poor. Since this topic was inspired by Christian theology, I think it’s fair to point out that this was one of the foundational teachings of Christ, one that at its heart, asks us to embrace people and situations that make us uncomfortable. When I look at my own ways of including people or experiences, I find that a lot of the time I am acting from a surface level of compassion. It is easy to be inclusive of the LGBT community, of immigrants, of Muslims, groups that at present are often pegged as ‘marginalized’ because they don’t make me uncomfortable. Yet, I run from any discussion about the current political climate, equally fast from those supporting and dissenting Trump’s policies. The fear and reactivity of both groups makes me incredibly uncomfortable. Not wanting to feel this discomfort, I disengage. This act of disengagement, whatever person or situation we are avoiding, often causes us to remain close to our centers, failing to even encounter, let alone include what is at the periphery of human experience. So, John was a little rough around the edges, but he demonstrates to me the different levels of inclusion. In asking him to sit with us, I left that campground with John’s story, according to John, not some alternative narrative I invariably would have made up about the white pick-up truck circling our campsite. And I saw in John someone willing to live on the boundary of the human experience. No one chooses to have ADHD, become homeless and enough of a burden to their girlfriend that they move into a campground, but John owned his story and somehow remained open and curious enough about his experience that he sat with a bunch of strangers and meditated. I still think that was pretty radical. I recognize that there are plenty of reason why we don’t live with our hearts forward, like John was living, all the time. We’re evolutionarily hardwired to protect ourselves and in a great bit of cosmic humor, being soft is hard. It makes sense to me that it’s the people who have faced the most suffering, that often have the greatest capacity for compassion. When we live in a place of privilege and comfort, we are not forced to exercise the very important heart muscle, so like any other muscle in the body it atrophies, crying out in soreness when asked to suddenly be used again. It’s a reality I’ve seen a lot, this political season. To be utilized at its full capacity, the heart needs exercise, practice. This is the third foundation of tenderness. 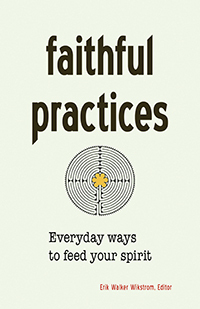 Now, just like there are different ways to workout, there’s many different types of spiritual (or secular) practice or exercise. You could join a formal exercise class, with planned workouts, a group of other people who show up each week to keep you accountable and come with a lot of support. The spiritual practice equivalent for me, is the formal practice of mindfulness and Buddhism that I’ve begun to cultivate. Or you could get in shape through more informal means, choosing to walk to work each day, lifting the milk jug three times when you take it out of the fridge with both your dominant and non-dominant hand, or picking up a hobby like birding that requires you to hike through the mountains. One of the frequent and informal acts of heart work I do in my own life is speaking honestly about my partners. Sure, I had a moment of formal “coming out” to my parents when I was 17, but there’s a moment with each new person that I meet where it comes up that I have a girlfriend, and I don’t know how that will be received. What’s healthiest and probably most successful is a mixture of these options and to note the places where you didn’t realize you are exercising your heart, as well as the opportunities to do so that you’re not taking advantage of. It took me way to long to identify how much of a heart exercise writing these homilies is. Every time I do it, I fight against an internal dialogue that the topic I selected was terrible, then I procrastinate, procrastinate, procrastinate often getting stuck in the writing process where it gets personal. I always find myself in nervous knots the days before and morning of, my speaking anxiety at full swing by the time I’m standing here. But, you all show up, keeping me accountable, and we get through it together. I come off the services feeling the fatigue and rawness of a good workout, but that my heart is a little stronger. Thank you. I bet you all didn’t know that you are excellent personal trainers. We wouldn’t exercise or practice if all this intention and continued effort, didn’t get us somewhere. I don’t think that it’s a coincidence that when people speak about their growth and development they often describe a deepening of understanding. In the “Joy of the Gospel” Pope Francis repeatedly asks that we go to the root. Exercise and practice gets us closer to this destination. I believe that the ability to get to the root of an experience, feeling or thought, is the fourth foundation of tenderness because it allows you to identify what is most fundamentally supporting or blocking one’s ability to be tender. When we look into our own hearts and begin to discover what is confused and what is brilliant, what is bitter and what is sweet, it isn’t just ourselves that we’re discovering. We’re discovering the universe. We discover that everything is awake, and everyone is awake. Everything is equally precious and whole and good, and everyone is equally precious and whole and good. When we regard thoughts and emotions with humor and openness, that’s how we perceive the universe. We’re not just talking about our individual liberation, but how to help the community we live in, how to help our families, our country, and the whole continent, not to mention the world and the galaxy and as far as we want to go. There’s an interesting transition that occurs naturally and spontaneously. We begin to find that, to the degree that there is bravery in ourselves – the willingness to look, to point directly at our own hearts – and to the degree that there is kindness toward ourselves, there is confidence that we can actually forget ourselves and open to the world. Time and time again, when I look deeply at my own heart, I get stuck or become hard for three reasons; doubt, uncertainty or fear. Fortunately, these hindrances can be counteracted by faith, trust and courage. These qualities are the final foundations of tenderness for me. And, although we’d like to have clarity and empirical evidence that leads to perfect understanding of all things, the human experience is innately an individual and subjective one, so I can’t say what faith, trust and courage look like for you in your path towards greater tenderness. For me the revolutionary path of tenderness asks the same question; how close are we willing to move towards the depth of the human condition? How beautiful could our lives and world be if we cultivated the courage to do so?